All incoming students at the University of Nicosia Medical School are guaranteed accommodation in our two brand new, world-class student residences, both opening in the summer of 2018. SIX Student Residence, possibly the most stunning student accommodation in Europe, is a landmark building in Cyprus and the region. Split among six distinctive towers, SIX’s 314 luxury student residences rise 12 stories above Nicosia and offer spectacular views of the University of Nicosia campus, the city and the surrounding area. SIX is topped-off by the exclusive UNIC Club, a jewel-like, all-glass 12th floor rooftop restaurant, lounge and pool bar open only to the UNIC community, and an ideal place for residents of Six to relax in one of the most appealing settings in Cyprus. 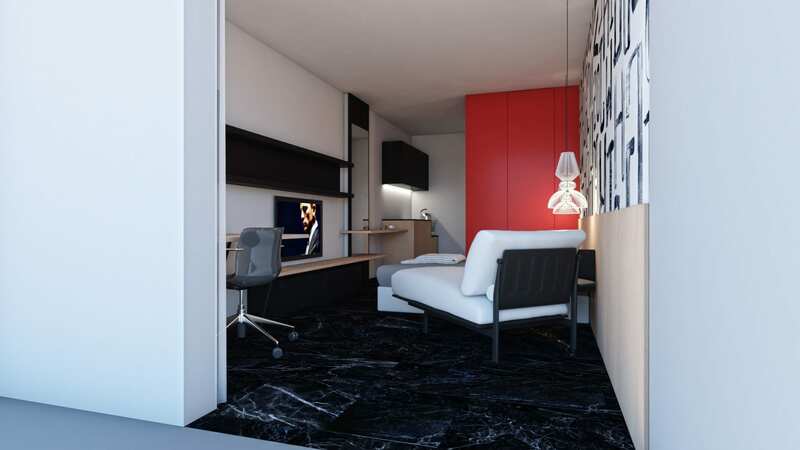 U Student Residence features an ultra-modern design with 399 rooms on seven floors, as well as four cafés and restaurants catering to a variety of tastes. Its single occupancy studios provide all conveniences, from an ensuite bathroom to a kitchenette and private balcony. U offers the additional possibility of sharing a 2-bedroom apartment at an even more affordable monthly cost. Both SIX and U are located in one of the most attractive areas in Nicosia, and are a few minutes by foot or bicycle from the Medical School, the central University of Nicosia campus buildings, and the other amenities of the bustling broader university campus (restaurants, coffeeshops, bars, supermarkets). The Student Services team can provide you with details on SIX and U Student Residences and assist you in finding suitable accommodation for your needs and budget. You will need to log in with the same username and password used for your online application submitted to the Admissions Team and choose “UNIC Medical School” from the drop down menu. Click here to visit the UNIC Residences website and reserve your room online. For further details contact our Student Service Centre ([email protected]).